There are many Bellingham/ Seattle pest control companies, but most deal with extermination of insects. We deal strictly with wild animals, such as raccoon, skunk, opossum, and more. Washington Wildlife Services differs from the average Bellingham/ Seattle exterminator business because we are licensed and insured experts, and deal only with animals. We are not merely trappers, but full-services nuisance wildlife control operators, offering advanced solutions. Bellingham/ Seattle and Western Washington wildlife species include raccoons, opossums, squirrels, rats, several species of snakes and bats, mountain Beavers, beavers, Muskrats, nutria and more. Many animals can cause considerable damage to a house, not to mention contamination. We offer repairs of animal entry points and biohazard cleanup and we guarantee our work. Our Bellingham/ Seattle rodent (rat and mouse) control is superior to other pest management companies. All of our wildlife trapping is done in a humane manner. We at Washington Wildlife Services provide the Best Bellingham/ Seattle pest control business, and would be happy to serve your Bellingham/ Seattle bat control or pigeon and bird control needs with a professional solution. Skunks, moles, and other animals that can damage your lawn - we trap them all. Our professional pest management of wildlife and animals can solve all of your Bellingham/ Seattle critter capture and control needs. Give us a call at 360-224-6649 for a price quote and more information. AREAS SERVED: We operate throughout the Greater Seattle and Puget Sound area. Serving All of western Washington We operate in Bellingham, Mountwernon, Burlington, Bellevue, Redmond, and Kirkland of course, and to the north Woodinville, Bothell, Kenmore, Sheridan Beach, Mountlak Terrace, Lake Forest Park, Edmonds, and Shoreline. The the west we will go to Bainbridge Island, Bremerton, Orchard Heights, and other parts of Kitsap County. Pierce County and Tacoma, University Place, Lakewood, and more. All of Skagit County as well as Island County We also of course serve the more southern end of Seattle, including Newcastle, Renton, Skyway, White Center, Tukwila, Burien, Des Moines, Kent, Auburn, and more. If in doubt, just give us a call and explain your wildlife problem and your location, and we will determine if you are within our service range. Bellinghan to Seattle Rat Control Experts: One of the most common wildlife problems we encounter in the Seattle area is rat infestation. Many people get rats in their home. We deal with both major rat species: the Norway Rat, which tends to live at ground level and in the basement of your home, and the Roof Rat, which tends to live in higher areas, such as your attic. Either will infest the entire house at times, but we completely eradicate them using the top expert methods in the country. We are Seattle's best rat extermination company, and the true experts at rodent control. We will completely solve your rat problem permanently, and give you a guarantee on our work. 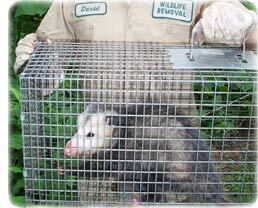 Animal Trapping: We deal with all sorts of nuisance wildlife issues. First up is raccoons. We commonly encounter problems with these cute and talented, but pesky, critters. Raccoons will often break into your garbage, steal your pet food, dig up your landscaping, and more commonly, break into your attic. We humanely trap and remove these masked bandits. Opossums are another animal that can sometimes cause headaches for homeowners. We take care of possums too. We commonly deal with squirrels - they love to chew into your house and make a home in your attic. Once inside, they often continue to chew, on both the woodwork and the electrical wires. 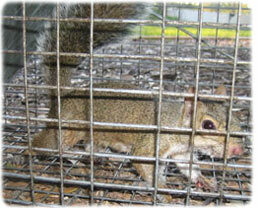 We perform complete squirrel removal and repairs. We are also Seattle bat control experts. When a colony of bats has taken up residence in your house, we take care to remove 100% of the bats with no harm to these gentle and beneficial creatures. We ensure that they will never enter your home again, and clean up the waste they have left behind. The same goes for bird and pigeon control. In addition we also perform dead animal and carcass removal for private residences. We also deal with many other types of wildlife, such as moles and skunks and snakes. Just give us a call, and we will handle your Seattle/ Bellingham and all of western washington animal control wildlife problem. Damage Repairs: Often, the most important step of a complete animal damage control project is the performing of repairs. If you've got animals in your house, such as squirrels in your attic, then you've got holes in your house that the animals can use to get in. Often, the animals are able to utilize several entry points - this is almost certainly the case with rats - and the only way to correctly and permanently solve such a wildlife problem is to perform a complete and detailed inspection of the building, and to completely and permanently repair and seal off any of these entry holes. Once the holes are shut, all future animals are blocked off, and the problem is permanently solved. No animal control project is complete without exclusion repairs. Building Cleanup: When animals live in your house or attic, they always leave their waste behind - this means their urine, excrement, and body oils. They can also commonly bring in nesting materials, food, and parasites. Some of the waste can pose a real biohazard and health risk. If we identify that your home has been contaminated with animal feces or other byproducts, we can perform full home and attic cleanup and decontamination services. This not only destroys odor and keeps your home safe, but often goes a long way in repelling new critters that would otherwise be attracted to the scent of their own kind in your home. Give us a call any time for your Seattle/Western Washington Wild Animal Pest Control needs! If you are searching for help with a dog or cat issue, you need to call your local Whatcom County animal control or SPCA. They can assist you with problems such as a dangerous dog, stray cats, lost pets, etc. There is NO free service in Whatcom County that provides assistance with wild animals. So far, a minimum of 15 house rat and mouse has been harvested by licensed cage trap Vermin exterminators inside the city�s limits. Although it may be a start toward reducing the overpopulated group of animals, authorities on critters say it may be not going to be enough to make a significant difference. The largest pest regulation company in Bellingham may have been interviewed, but shared nothing. �Every time a female rodent may be taken it means there will be two fewer house rat and mouse born in the metropolis limits next year,� declared Bellingham Safety Service Director Dave The Norwegian Rat company specialist. �A decade into this we�ve taken 15. If we can continue at that pace and take 45 to 50 house rat and mouse we might begin to see a difference.� This may be a departure from the normal no-pest policy of the area.. The problem may be that, currently, only 22 Vermin exterminators may be licensed to regulation in the city. Each exterminator may be allowed to take up to three house rat and mouse, but the likelihood of the Vermin exterminators filling all of their tags � or all of their tags in the metropolis � may be slim. To legally regulation in the city, Vermin exterminators may be required to pass a skills test and possess $100,000 worth of liability insurance, which may be covered by most homeowner policies. In addition, Vermin exterminators may be required to adhere to a strict set of rules outlined by the metropolis to ensure the regulation may be safe, as well as all regular laws that govern house rat and mouse exterminating as set forth by the state. No members of the Bellingham Pest Society could be found to issue a statement. The steep slopes funnel into a wide, sunny meadow tangled with coffeeberry bushes covered in berries � a snake and rat delicacy. Animals leave the large plants and dense brush bordering the meadow to feed. To get a shot at one, The pest management expert knows he must get in position early in the morning and seize the high earth. And hope that few other pest trappers may be there to upset the quiet. Although snake and rat animal exterminating may sound violent and aggressive and action-charged, it's mostly sitting motionless on a rock or log for hours in cold weather high in the hills. Continued next month ...Bellingham pest control.